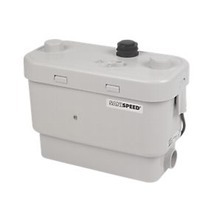 Sanispeed Silence is the perfect quiet solution to install a complete kitchen or a laundry room at the ground level or in the basement. It is specially designed to deal with the hot soapy pumped waste water from dishwasher or washing machine. 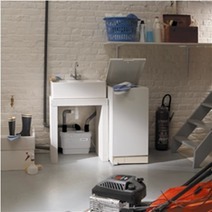 Sanispeed, the stronger commercial pump for the more demanding kitchen or utility room. 3 x inlet connectors, 1 x end cap, 2 x metal hose clips, 6 x plastic clips, 1 x vent cap. H x W x D: 350 x 373 x 185mm. Connects to 32mm discharge pipe.